PUSH Industries have been in touch with a couple of new things. Firstly, we reported on PUSH Industries ACS3 Coil Kits before, but at the time they were only available for Fox 36 forks. 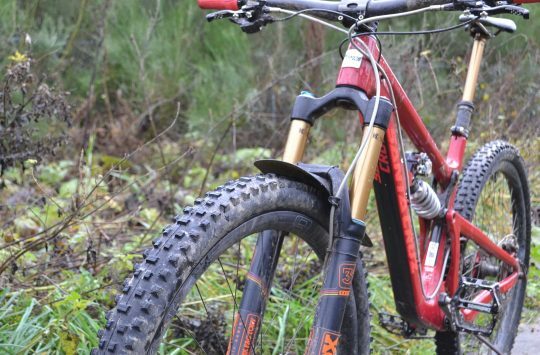 Now they’ve launched for Rockshox Pike, Lyrik and Yari forks too. 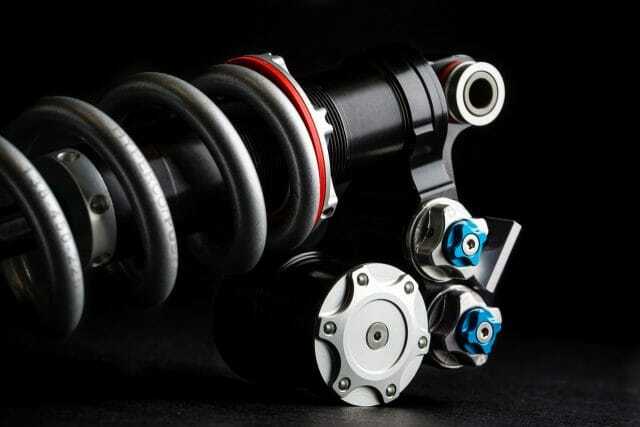 Stealing the show though is their ELEVENSIX coil shock, now available in metric sizing and trunnion mounted for those bang up to date new frames. The difference isn’t just the colour – note the trunnion mount holes on the left. If you absolutely had to do chi chi colour matching and money was no object, what kind of frame would you put this on? Here’s the non-trunnion mount version, which will also now be available in black. 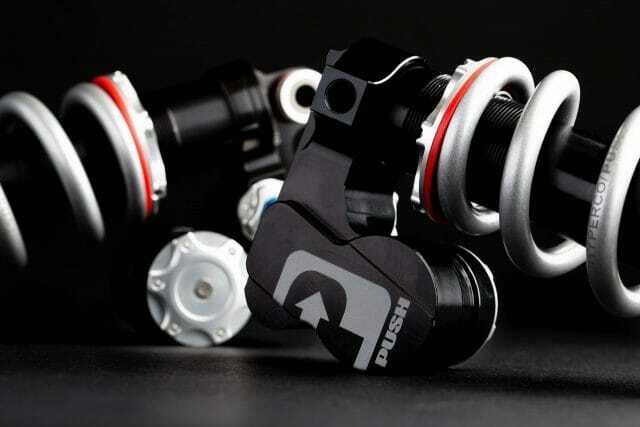 For riders who’ve bought one of the clear anodised versions before, PUSH will also be offering a colour match upgrade. Price apparently “less than a kidney” but “requires commitment”. The dials on the right are the key to the ELEVENSIX shock. They’re two independent sets of high and low speed compression settings, with the switch between them to select. The idea is you can precisely tune one set for climbing, and the other for descending. Black. BLACK. Like the endless expanse of space. “LOVELAND, Colorado — PUSH Industries is expanding its range of high performance suspension components, and is pleased to announce some new flavors of its tastiest goods. 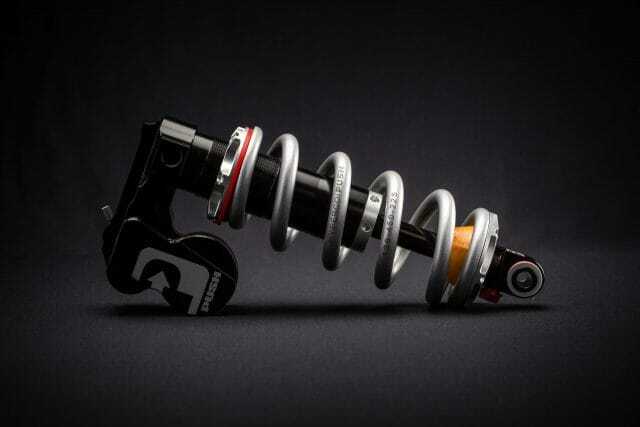 “TRUNION AND BLACK ELEVENSIX MODELS: As a result of the rising popularity of trunnion-mount shocks, PUSH is now offering its ELEVENSIX in a trunnion design to meet the demands of riders seeking the ultimate performance from their bikes using the new wider shock mount design. The new trunnion-mount shock is available in metric sizes comparable to the eye-to-eye lengths of standard ELEVENSIX shocks. 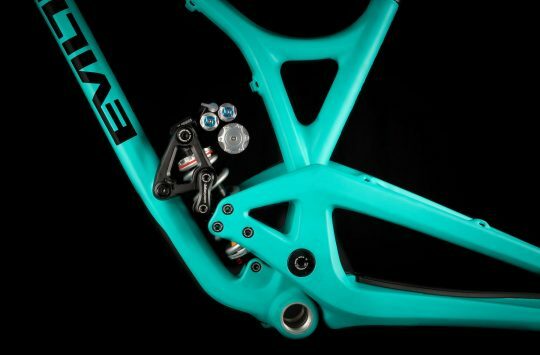 In addition, being more compact than eye-to-eye shocks, the new design allows certain shorter-travel bikes to take advantage of the ELEVENSIX’s Dual Valve System. One such example is Evil’s Calling, which will be available with an ELEVENSIX upgrade in the new Liquid Black color. “Liquid Black? 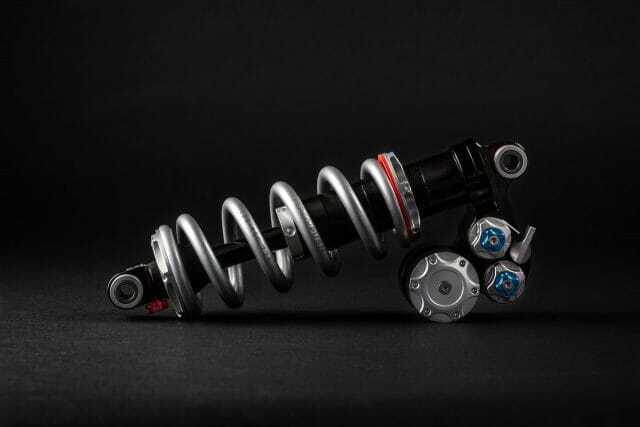 Yep, all ELEVENSIX shocks are now also available in a black anodized finish, in addition to the original clear anodizing. In order to ease the concerns of those suffering from extreme colormatch FOMO, PUSH is offering an upgrade/rehab/12-step recovery program. It won’t cost as much as a new kidney, but it’ll be a color change that demands commitment. 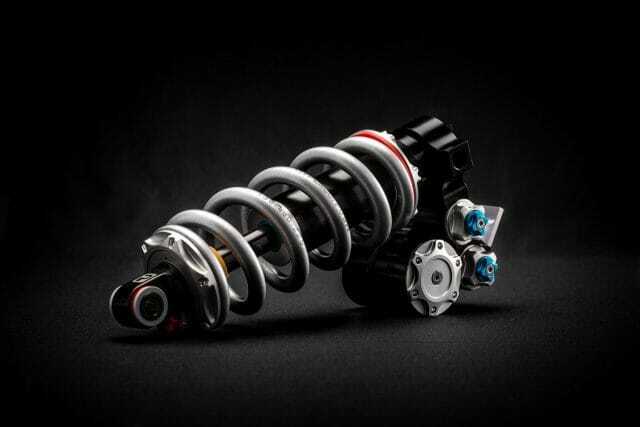 Riders who already have ELEVENSIX shocks that they wish were black should reach out to PUSH at sales@pushindustries.com. “ACS3 AVAILBLE FOR ALL ROCKSHOX RIDERS: The PUSH ACS3 coil system was released earlier this year as an upgrade for Fox 36 forks, and is now available to order for RockShox Pike, Yari, and Lyrik models. Replacing the stock air spring with PUSH’s proprietary coil and air-assist kit provides a dramatic enhancement in front suspension throughout the travel, enabling supple small bump response as well as greater mid-stroke control and superior bottom out resistance. For Pike riders looking to upgrade to ACS3 performance, there are three options — 140, 150, 160mm. Lyrik and Yari riders have four travel options ranging from 140 to 170mm. 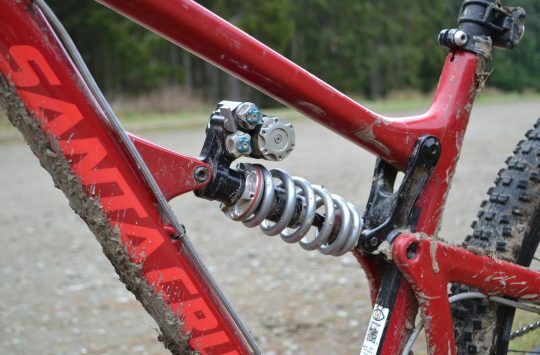 “RockShox ACS3 kits are available in seven different spring rates. The Made in the USA ACS3 is an easy install for home mechanics, with convenient step-by-step how-to videos available on Vimeo and the PUSH website. Two Ways To Brighten Your Day! Win this light from Lezyne with the Singletrack Gift Giveaway Day 14! gonna need a trunnion shock and Lyrik kit for the Merida 160 asap I reckon… would love to see the difference it makes.! Only $1,200 for the shock – that’s some ‘commitment’!